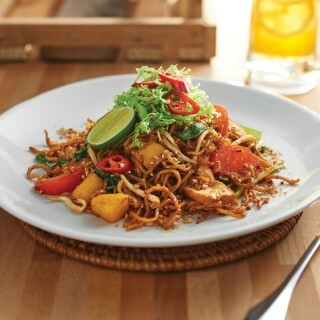 An all-time Malaysian favourite dish! A mouth-watering bowl of noodles in spicy coconut curry gravy with chicken, fish cakes, long beans, cockles, fried beancurd skin and beancurd puff. 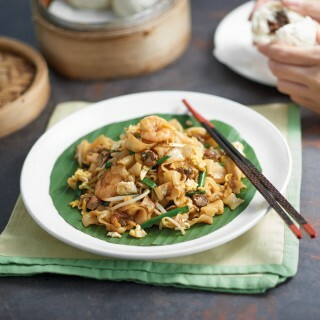 Translated literally to "slippery egg noodles", this wok-fried kway teow dish gets its name from the soupy egg gravy that we fill with prawns, chicken slices, fish cakes and vegetables. Egg Noodles, also known as wanton mee ("wanton" is a Cantonese word for dumpling while noodles in Hokkien is "mee"), garnished with vegetables and fried beancurd, served with curry chicken. Egg Noodles, also known as wanton mee ("wanton" is a Cantonese word for dumpling while noodles in Hokkien is "mee"), garnished with vegetables and fried beancurd, served with dumplings in hot broth. 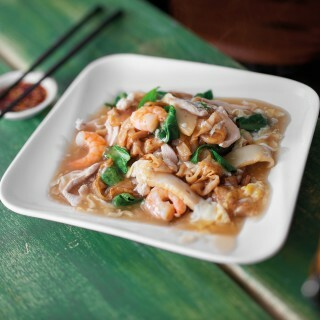 Flat rice noodles in chicken soup, topped with prawns, chicken slices, chives, bean sprouts and spring onions. 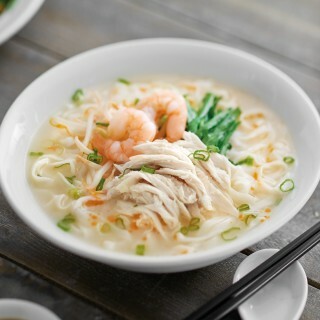 Flat rice noodles in chicken soup, topped with chives, spring onions and bean sprouts. This popular Malaysian dish is accompanied by a plate of steamed chicken.